Smoking and Birth Control: What are the risks, if any? What are the Risks of Smoking While Using Birth Control? The Surgeon General first issued tobacco-related health warnings in 1964. That was the year cigarette smoking peaked in the U.S., with 42% of adults using cigarettes and tobacco-related products. Fortunately, cigarette smoking has decreased dramatically since those first warnings were issued. 37.8 million U.S. adults smoke cigarettes, and more than 16 million of those adults have a smoking-related disease. Fortunately, smoking has declined to about 15% of the total adult population, down from 20% in 2005. The health risks of cigarette smoking and tobacco use are well-known, but are those risks increased when women take hormonal birth control pills? In some cases, yes. But, some birth control pills are safe for smokers, and age plays a significant role in which types of contraceptives smokers can use. What are the risks of smoking on birth control? Smoking is not recommended for women who take either oral contraceptives, the patch, contraceptive injections or use vaginal rings. 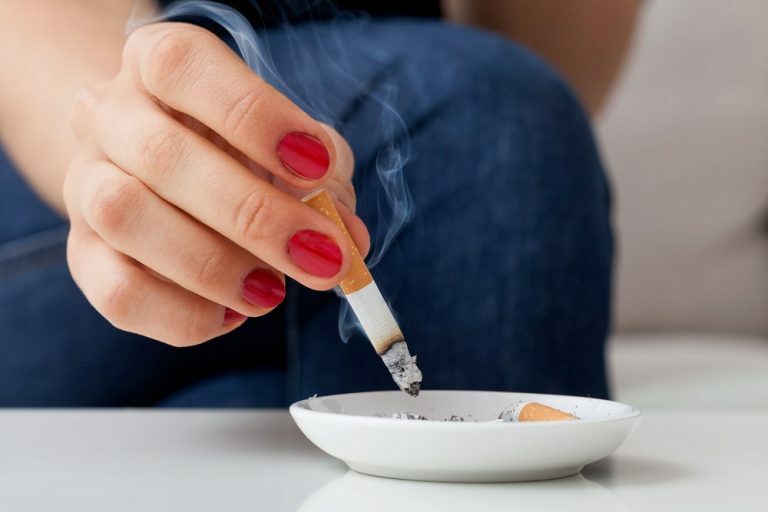 Unfortunately, tobacco and nicotine are highly addictive, and it is incredibly difficult for a lot of women to quit smoking, despite the dangers. Studies show that eight out of ten women will continue to smoke while taking the pill even after their doctors warn them about the risks and side effects of smoking on oral contraceptives. In some cases, women who smoke aren’t even aware that smoking is a problem when it comes to hormonal contraceptives. Other surveys indicate that up to half of all women who got a prescription for birth control did not inform their doctors of their smoking habits. A majority of surveyed women do not know that there are safe contraceptive alternatives for smokers. There are many risks associated with birth control and tobacco use. Smoking while on birth control restricts blood flow to the heart and constricts blood vessels. Taking some oral contraceptives past the age of 35 can also increase the risk of blood clots, and smoking significantly increases these risks. Does vaping have the same risks as smoking while on birth control? Vaping is relatively new to the market, and there aren’t very many studies on the effects of vaping and birth control. Currently, there are nine million U.S. adults who vape. Nicotine, the active ingredient in vaping products and also cigarettes, is what increases the risk of blood clots and adversely impacts the cardiovascular system when someone takes birth control. Despite the lack of definitive studies in this realm, it’s safe to say that vaping should be avoided while taking combination oral contraceptives or the patch, injections, or birth control ring. Do birth control pills alone increase the risks of blood clots or cardiovascular issues? After the age of 35, certain types of birth control by themselves can increase the risk of blood clots, which can cause heart attacks or strokes. Combination oral contraceptives, the patch, injections, and the ring increase these risks in older women. However, there are many safe alternatives for smokers, vapers, and women over the age of 35. How does estrogen increase the risk of blood clots? Overall, men are more likely than women to suffer from blood clots. But hormones that are unique to female biology increase the risk of blood clots in some women. Estrogen, in particular, increases clotting factors in the blood, and this is one of the reasons why pregnant women are at high risk of blood clots since estrogen levels are elevated during pregnancy. Birth control pills increase the risk of blood clots three to four times, but the overall risk is still minimal. Only 1 in 3000 women who take birth control are at risk of blood clots. What types of birth control are safe for women who smoke or vape? When the pill was first introduced in the 1960s, it had high levels of estrogen at around 100 micrograms per pill. Now, most combination hormonal contraceptives contain 30 to 50 micrograms of estrogen. These types of hormonal contraceptives may not be a good idea for smokers or women over the age of 35. Instead, there are oral contraceptives with low doses of estrogen, at around 20 micrograms a pill. This is a much safer level of estrogen for people who use nicotine products or are over the age of 35. Also, there are birth control methods that do not contain estrogen, such as copper IUDs. Barrier methods are also effective ways to avoid unintended pregnancy, but these methods do not offer the added health benefits that women can get when they take the pill, including protection from bone density loss and prevention of ovarian and uterine cancers. Birth control pills are also safe to take continuously to avoid debilitating and disruptive PMS symptoms. When deciding which method of birth control is right for her, it’s crucial that women discuss their medical history and whether or not they smoke or vape with their doctors. It’s also a good idea to discuss and formulate a plan for quitting smoking or vaping. Although vaping devices have been marketed as a way to help people quit smoking, vaping has not been approved by the FDA as a legitimate smoking cessation device. Studies show that most people who started vaping to quit smoking cigarettes ended up continuing to smoke both regular cigarettes and e-cigarettes. Women who smoke die on average seven years earlier than women who do not smoke. For women on birth control, the adverse health effects of smoking are even riskier. Quitting smoking improves health outcomes for women and also makes it less dangerous to use birth control. Although newer, lower dose estrogen pills are safer than older generations of contraceptive pills for smokers to use, they still aren’t entirely risk-free. For smokers who wish to start using oral contraceptives, Pandia Health can help them find a birth control pill that is safe and effective for them. With access to knowledgeable, helpful doctors and the convenience of having birth control delivered to home, contact Pandia Health today to explore your options for birth control.